I was looking for the plans to see how you enter the roof, but I couldn't find them? 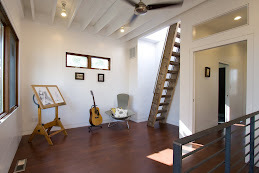 Do you walk up a ladder, through the roof hatch, and right onto the wood deck or do you walk on the green roof? I'm liking the deck though! Is it safe for anyone to walk up there? I am guessing it's not like walking up another flight of stairs to get up to the roof? There is a steep ship ladder that's located in the 3rd floor den that brings you up through the roof hatch. See the post from Wed, May 7th for the plans that show the location of the ladder. You do not walk on this type of green roof. It it safe to get up there and we are in the process of installing a steel cabled rail on the deck so it will be safe for everyone while you're up there. Thanks for the comment. Nice idea but very unsafe hatch should have sum type of guard rail around it so no one can fall in the opening. There are OSHA required hatch rails. rooftopaccessories.com bilco.com just to name two.